(VANCOUVER) A party of Living Historians who are hitting a long, hard trail will get a warm, traditional send-off at Klahowya Village in Stanley Park. The members of the R.E. Living History Group (RELHG) will be among a 10-member expedition taking the 1861 Pack Trail from Keithley Creek to Barkerville to celebrate the 150th anniversary of the trail’s construction. They’ll receive blessings for the journey at Klahowya Village this Friday (July 29). “We’re thrilled to be given the opportunity to begin our journey at Klahowya Village,” said RELHG spokesperson Lisa Peppan. On August 3, the party of 10 Living Historians (seven men, three women) will depart Keithley Creek (near Williams Lake) with their outfitter and head for Richfield, the gateway to Barkerville and the heart of the Cariboo gold rush. For three days, they’ll traverse a rugged 40-plus kilometre route through alpine and sub-alpine terrain using period-authentic tents, food and equipment. They’ll recreate the daily life of the 19th Century gold-seekers who kick-started one of the richest, wildest gold rushes ever to take place on the planet. “The 1861 Pack Trail is just one of many great heritage trails in the province and Klahowya Village is a gateway to all of them,” said Cheryl Chapman, Training and Product Development Manager for Aboriginal Tourism Association of B.C. and Co-chair of the New Pathways to Gold Society (NPTGS). Klahowya Village is a cultural visitor experience that merges traditional artisan village elements with contemporary Aboriginal experiences and authentic art, culture and traditions. The village runs from May 16 to September 11. A partnership between the Aboriginal Tourism Association of B.C. and the Vancouver Parks Board, it offers visitors a taste of Aboriginal cuisine, artisan kiosks and a ride on the Spirit Catcher Train through the forest of Stanley Park. The 1861 Gold Rush Pack Trail Ride is a partnership between NPTGS, Barkerville Historic Town, RELHG, Aboriginal Tourism B.C. and the District of Wells. The ride will be filmed by JPS Media Works of Vancouver, producers of the popular “Simon Sees” series of travel videos. Barkerville’s Visitor Experiences Manager James Douglas admits the RELHG will make a couple of concessions to the modern era. One is by placing geocaches along the route, allowing GPS enthusiasts to retrace their footsteps. The other will be by posting to Tracebook, a heritage-minded social media initiative jointly sponsored by Barkerville Historic Town and NPTGS. “Tracebook uses purpose-built Facebook fan pages as a launching pad for on-line historical interpretation,” said Douglas. “Historical ‘characters’ can comment on their daily activities, interact with each other through wall posts, and provide links to information about their lives. “Facebook users will want to check out the Tracebook Core page for up-to-date information regarding the 1861 Gold Rush Pack Trail Ride, including daily updates from the trail,” he added. The daily posts to Tracebook will give insight to life during the Cariboo Gold Rush. The RELHG will follow the historic 1861 route into Williams Creek by way of the Forks of Quesnel, Snowshoe Mountain and the head-waters of Antler Creek. And they’ll use 19th Century gear. The RELHG is an informal group of history enthusiasts dedicated to keeping alive the memory of Colonel Moody’s Royal Engineers. 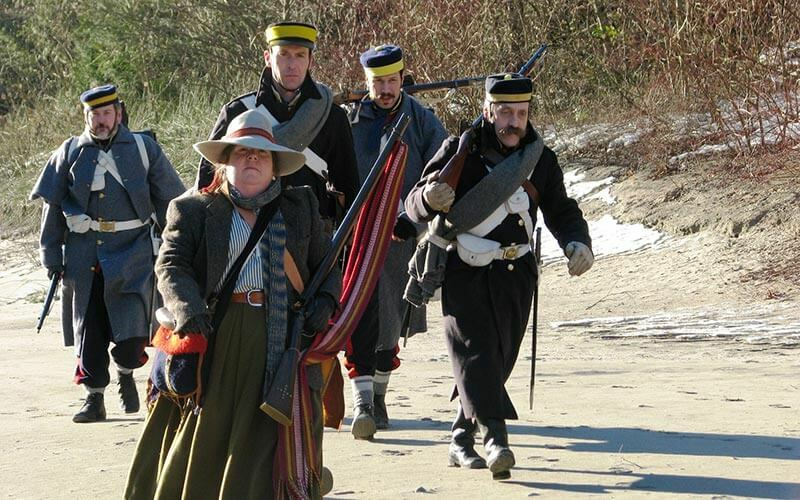 Using period clothing and equipment, they bring B.C.’s Colonial era to life. NPTGS is a non-profit society working communities along B.C.’s Gold Rush/Spirit Trails with a focus on heritage tourism-based economic development.